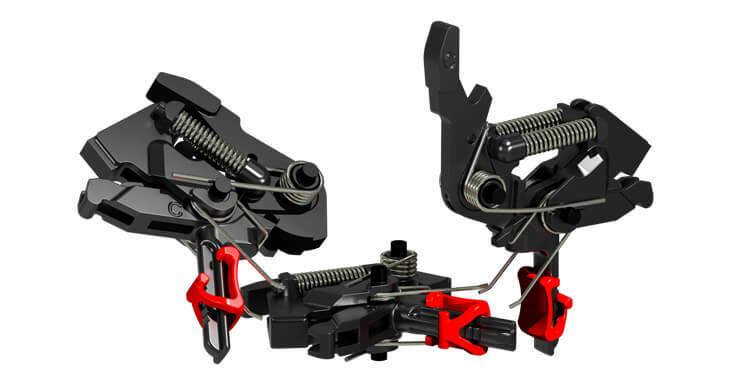 All the products have 3 or 2 basic user-adjustable trigger weights shown in the top line by the 3 different colored toggle spring set ups in the case of the 24s and 2 different colored hammer hammer spring set ups in the case of the EDTs. 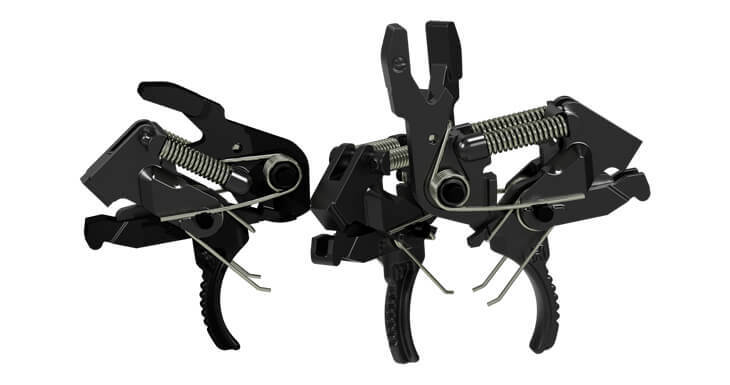 The 24C and ECLispe have 5 shoe positions, so they have 3×5=15 different adjustment pull weights. The colored dots on the weight scale correspond to the springs installed by color. 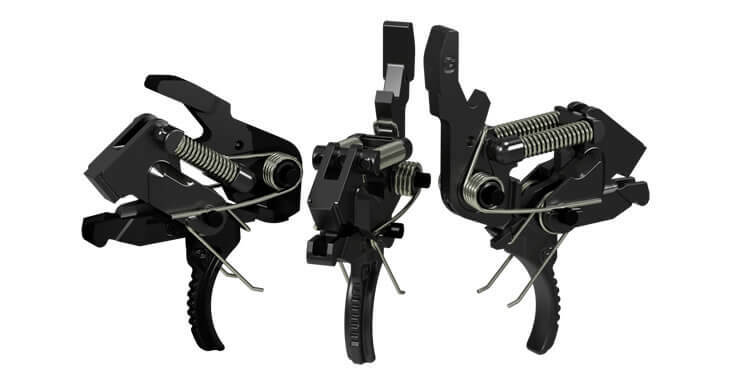 All the triggers have the highest hammer fall energy of any AR trigger anywhere when using the gray toggle springs (24s) or the red hammer spring (EDTs) and near stock hammer fall power when the others are installed The hammer fall energy is compared to a stock or MIL-spec trigger set up shown in green by and further scaled by mini-bar charts. The next three lines highlight specific design shape features. 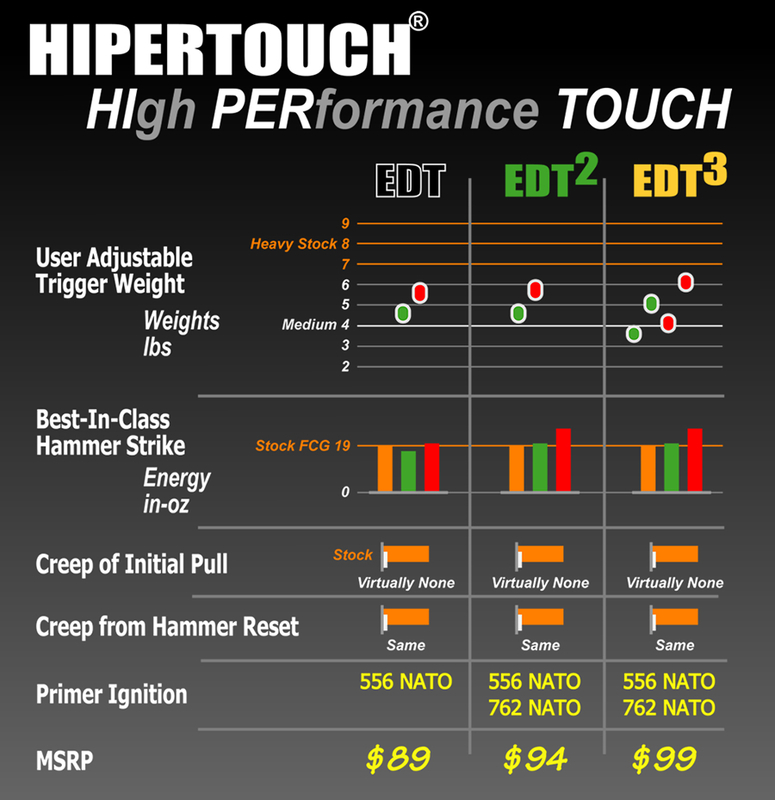 The next line, Pre-Travel of Initial Pull, shows how much “creep” is in each HIPERTOUCH® trigger (creep is defined as the distance, or feel, of one metal component sliding on another). 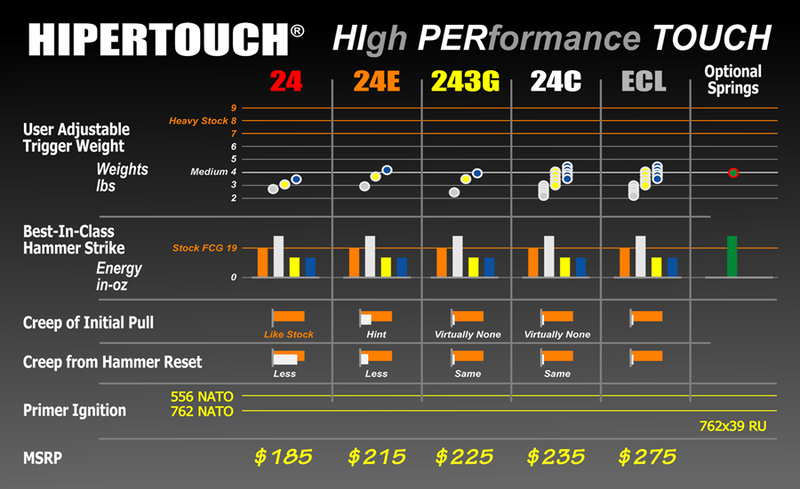 This is then compared to a stock or MIL-spec trigger and among one another other using a horizontal, green, baseline, mini-bar chart representing the stock or MIL-spec trigger. Importantly, the Pre-Travel from Hammer Reset, shows the amount of creep compared to the creep of the initial pull, i.e. the creep to expect after taking a shot, letting off the trigger and taking a follow-up shot at the point of hammer reset. The last line shows the type of cartridge the triggers can handle. The last column shows that an optional spring combination (green toggle springs and red hammer spring) that can also handle 762×39 Russian rounds, which have notoriously hard primers w/ 100% ignition, i.e. no light strikes. 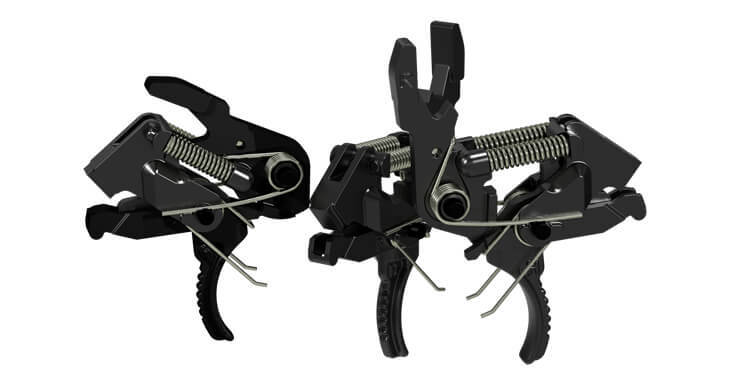 Of course, the triggers can also handle 300BLK, 22LR, 9mm, etc. Again, it’s only a summary. Getting your finger on one or more of the triggers will tell the rest of the story. Contact us if you want more detailed information.